Here we go, my spin on a classic French dish. 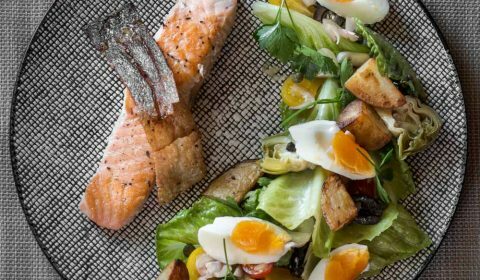 Crispy Salmon Nicoise, and if you are like me and love salmon, you will love this recipe. Crispy salmon is probably one of my favourites things to eat. Plus, I decided to take the crispiness of the skin to another level. Now making the salad is easy and straightforward. But when it comes to cooking the fish, I encourage you to take your time and take care when cooking it. Not to discourage you, it’s not that difficult. But remember, fish cooks very quickly, if you cook a steak, you have more time and you can end up with different results. Rare, medium rare etc. But fish is a lot more delicate and is less forgiving if you overcook it. And dry, chewy fish ain’t what you want. When making crispy salmon, you could just sear the fish on both sides until cooked through and you’ll get a great result. But there are 2 very simple things you can do to make the skin extra crispy. First, you make some incisions in the skin before frying it. And two, once you have cooked the salmon, only one side of the skin is crispy. So removing the skin for salmon and frying it on the other side is what makes the big difference. I couldn’t think of a better salad recipe to pair with the salmon. It has that saltiness of the capers and olives. It has potatoes which always goes well with fish. Oh, and not to mention the anchovies. Now I know a lot of people aren’t a fan of anchovies because they smell a bit fishy. And they think because of that, they will make the whole dish smell and taste fishy. But remember, we aren’t stuffing whole anchovies down our throats. In this recipe, I use one chopped up anchovy and mixed it through the salad, which isn’t much at all. And in my opinion, you shouldn’t need much. They are used as a seasoning more so than an ingredient. You don’t have to use the anchovy, but I encourage you to give it a go. Thank you all so much for reading this post. I always have a blast sharing these recipes with you. Next up, I will be posting rosewater cake so stay tuned! 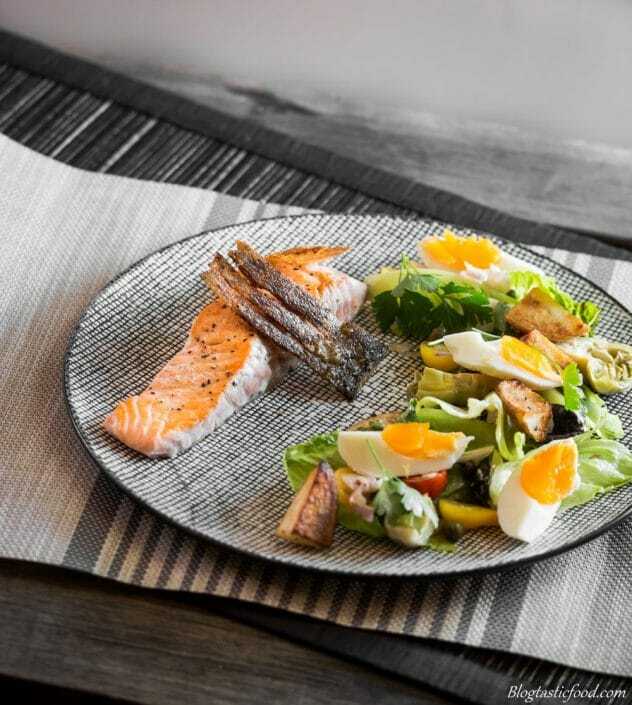 Crispy salmon nicoise salad made extra crispy. Which goes perfectly with this wonderful, fresh salad Nicoise. Whisk all of the ingredients in a bowl for about 1 minute until the dressing thickens and is well combined. Pre-heat a frying pan on medium-high heat, making sure it gets nice and hot. Add half of your olive oil, then add your potatoes. Fry for about 10 minutes until cooked and golden brown tossing/stirring occasionally. When the potatoes are done, season them with salt and pepper, turn the heat off and transfer them onto kitchen paper to drain. Do not discard the pan. Meanwhile, put your eggs in a pot, then add enough cold water to cover them. Bring the water to a boil, as soon as the water is boiling, turn the heat down low to a gentle simmer. Simmer the eggs for a further 7 minutes. While your eggs are cooking, put the ice in a bowl and fill with water. Use a slotted spoon to gently transfer the eggs to the ice cold water and leave for 1-2 minutes, then drain. Crack the eggs then carefully peel them. It helps to peel them under some running water. Put the artichokes, cherry tomatoes, black olives, lettuce leaves, chopped anchovy, parsley, capers and sliced shallots in a bowl. Make a couple of incisions in the salmon skin. Season the salmon both sides with salt and pepper. Pre-heat the frying pan again on high heat, ensuring it is nice and hot. Add the rest of your olive oil and then gently place the salmon in the pan skin side down. Fry for 4 minutes, then use a fish slice to carefully flip the salmon. Fry for another 1-2 minutes on the other side. Transfer the salmon to a plate or board. Carefully remove the skin away from the salmon (I like to use a small knife for this). Get the pan back on the heat, then add your skin back to the pan on the other side that isn't crispy. Fry for about 30-60 seconds, then transfer onto kitchen paper to drain. Add some of your dressing to the salad mixture (you can keep the rest in the fridge), then mix together with your clean hands. 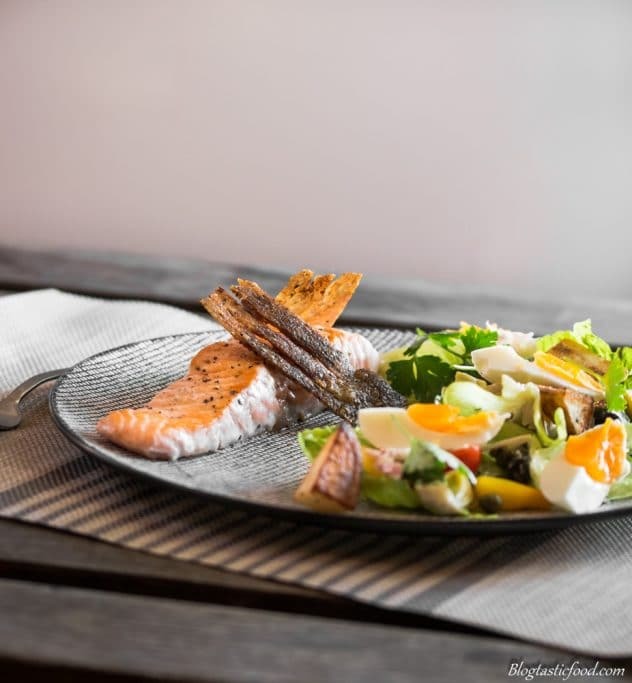 Serve the salmon in the middle of a plate with the crispy skin. Add some of your salad mixture on the side. Garnish with your crispy potatoes and your eggs. 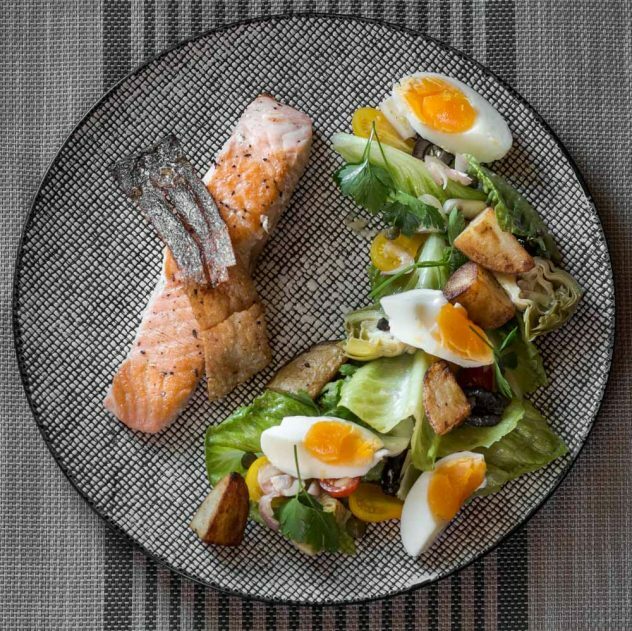 Enjoy your Crispy Salmon Nicoise Salad! Make some incisions in the salmon skin before frying it, that will make it even crispier. Make sure the skin is scaled before you fry it. Like most salad, dress this one at the last minute before serving it. Do not dress the salad in advance. I hope you enjoyed this Extra Crispy Salmon Nicoise Salad. If you did, then you will love this Broccoli Caesar Salad. Great looking salad. I’m going to have to try sardines one day. I love capers and anchovies. There goes my blood pressure but the pairing was great. How long did you boil your eggs? I believe I must over boil mine. I’m no expert so I had to ask one :). This looks amazing! I love salmon so will be trying this! Beaitiful recipe and photographs! Thanks for the share Nicolas. So beautifully plated Nick!! Who wouldn’t love to find this on their table?? 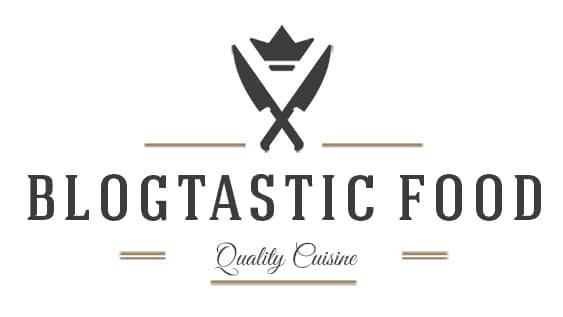 Great looking site sir… I look fwd to seeing more! Hi Nick. I just wanted to let you know that I love this so much, that I shared it to my FB Page Cook and Enjoy with The Recipe Hunter, Hope you don’t mind. This is just awesome. I did not want to link drop, but feel free to visit . This looks so good! Salmon is darn delicious.